American Gutter Inc. is a specialist in Seamless gutter, from the smallest residential job to the largest commercial job. We take pride in being able to provide superior products at competitive rates. With estimations and professional installation you will be assured of the quality and craftsmanship. Our crews will come out and form your gutters on site ensuring that no seams, except those at the corners and end caps are anywhere in your gutter system. From the standard case style gutter to super gutter to the beautiful half round you can be assured your gutters will be both functional and appealing. 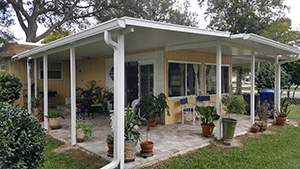 We install on all types of homes including, mobile homes, single story ranch and multi level homes. Our commercial applications include office buildings, hotels, churches and more. We have different styles and colors to choose from for both residential and commercial applications.